Future projections show that extreme precipitation events are very likely to continue to intensify during all seasons and that coastal Massachusetts will be particularly affected. Managing stormwater will help reduce the negative impacts of flooding from intense storms. Rain barrels collect and store rainwater run-off from buildings. Stored rainwater can be used to wash cars and water gardens and lawns. 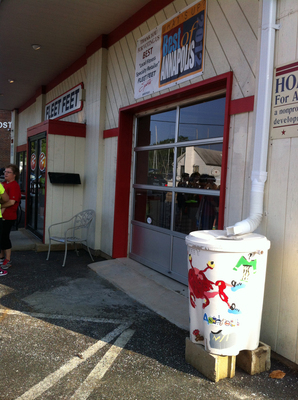 As a resut, rain barrels can help people save on water costs. Using stored water can also reduce the strain on local water resources, individual home septic systems, and municipal waste systems. Rain barrels reduce the amount of water pollution in our natural water systems since water run-off collects pollutants such as litter, animal waste, or fertilizer, as it runs towards storm drains. By slowing the run-off, rain barrels help to increase soil absorption of water and, as a result, aid in the recharging of groundwater? supplies. 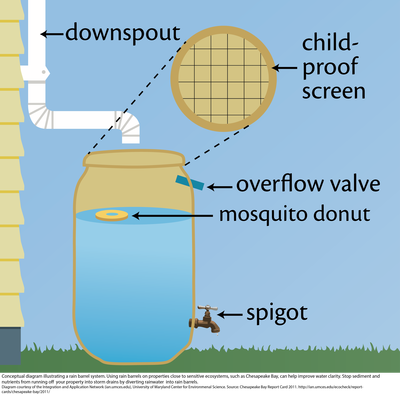 It is recommended that rain barrels have a tight top to prevent accidents, keep out egg-laying insects, and keep the stored water free of debris. The gutter spout should fit securely into the barrel lid and the overflow hose system should be pointed away from the building.